Welcome back to California Adventure for the second time today! 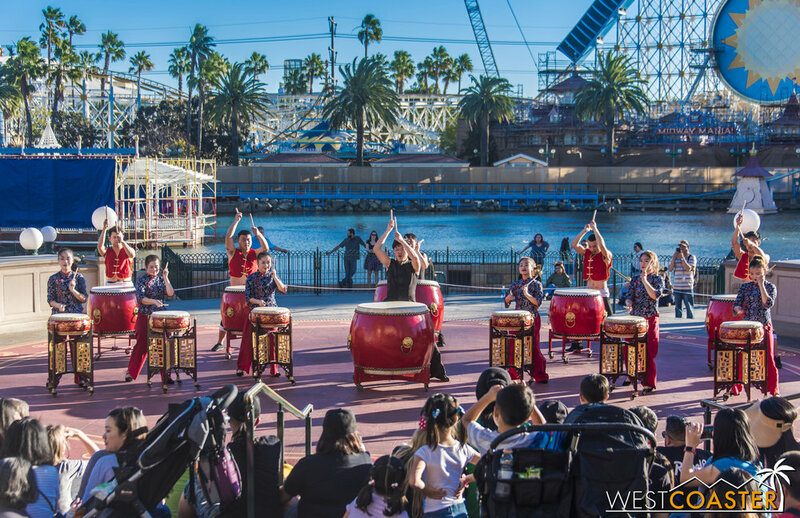 This time, we're stepping away from the sprawling construction work (as much as we can, anyway; it's still visible in the background of a lot of photos) and focusing on the Lunar New Year celebration taking place throughout the [remnants of] Paradise Pier. The festival kicked off last Friday and runs through Sunday, February 18--marking three weeks and four weekends of celebrations. This is the longest run yet and an additional week over last year. 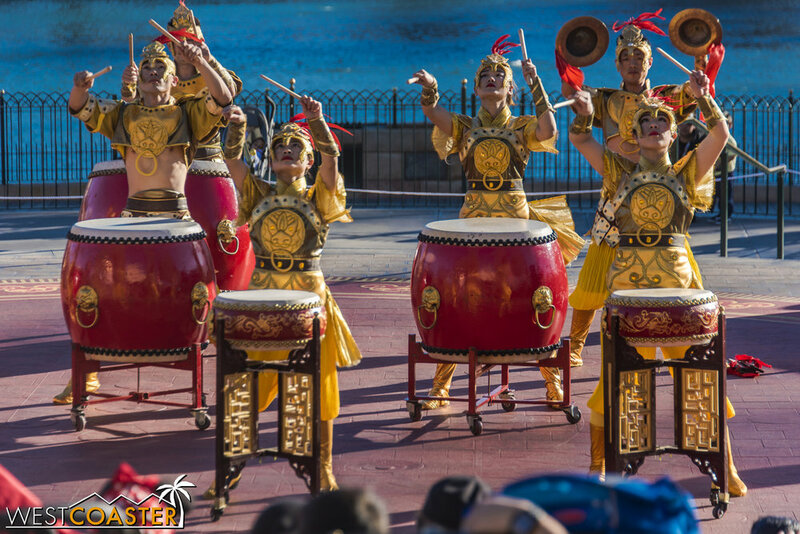 While part of this may stem from a later lunar new year this year, the fact that Disney continues to expand the run shows the event's success and popularity. This year's Lunar New Year event shares a lot of similarities with last year's festivities, which we covered as well, so check that out for more details. Some of the performers have changed, and a small number of food items are different, but the basic structure of the event and its offerings remains the same. Lets go check it out! 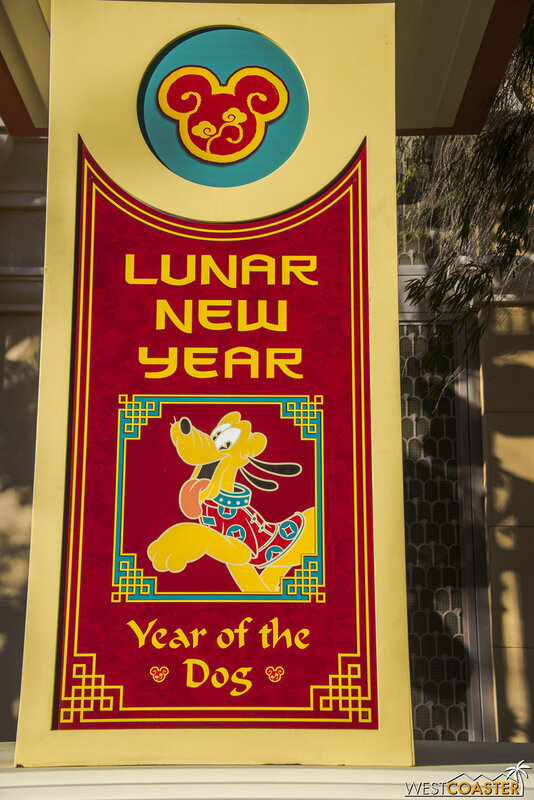 Signs for the Lunar New Year celebration are everywhere throughout the Disneyland Resort. This year is the year of the dog, so Pluto has top billing as mascot for the event. 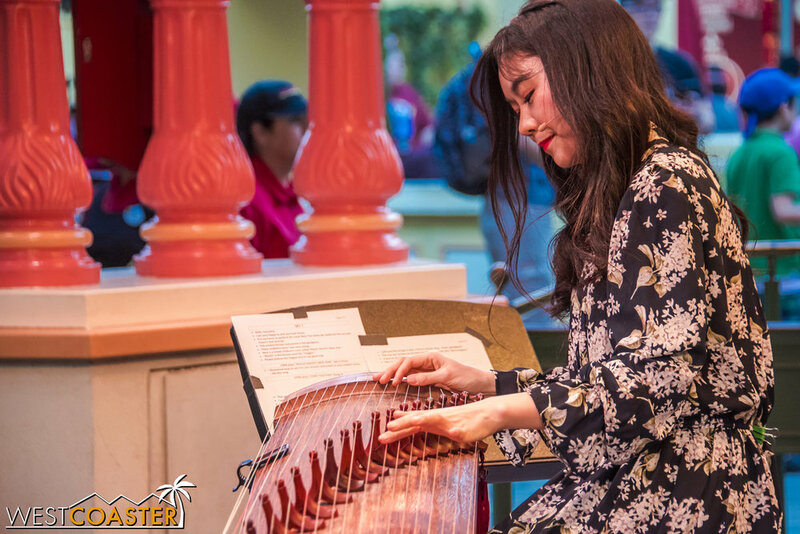 The actual content for the Lunar New Year festival is concentrated in Paradise Pier (in the area soon to become "Paradise Park"), running from the entrance of The Little Mermaid ride all the way through the Boardwalk restaurants (Garden Grill and Boardwalk Pizza and Pasta). 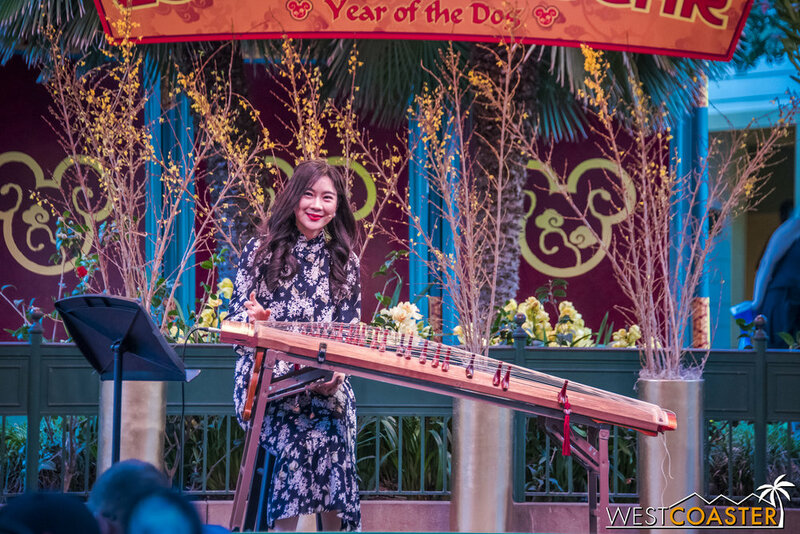 There are shows, food booths, a merchandise stand, character meet-and-greets, and activities--plus educational signage explaining the history and traditionals of the Chinese, Korean, and Vietnamese cultures that celebrate the lunar new year. Banners all across Downtown Disney are advertising this year's Lunar New Year celebration at DCA. 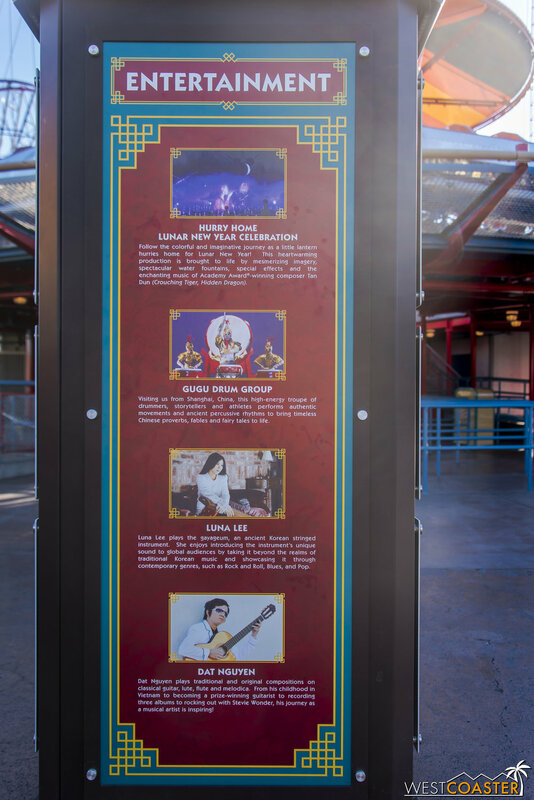 There's an entertainment guide, and Mulan is actually on the park map this year. Last year, they had Elsa, because they had to advertise the Frozen show at the Hyperion Theater. The Lunar New Year celebration starts just after The Little Mermaid: Ariel's Undersea Adventure ride. There's even a nice portal for it. Pluto is so happy it's his year! A line-up of the entertainment offerings can be found on several informational posts. More on these later. Of course, there are signs talking about how the various East Asian cultures celebrate the Lunar New Year. As you can see, the festival has its own nice little niche in this part of Paradise Pier. On a related note, this is the area that will be renamed to "Paradise Park" as its own themed land once the Pixar Pier secession is complete. Near Goofy's Sky School, there are a few activity areas mostly aimed for families and children to create craft-related lunar new year items. There's a brush painting and calligraphy, lantern making, wishes writing. It's a fun dip into the culture that surrounds the festivities of this momentous holiday in East Asian tradition. There are Chinese brush painting and calligraphy demonstrations at the covered areas beside Goofy's Sky School. Guests can write their new year's wishes on tags as well. Cerritos Chinese School offers some Chinese arts and crafts. Kind of cool to see the place where I went to Chinese school for a few years as a kid make a feature here. Or make your own Disney lantern! 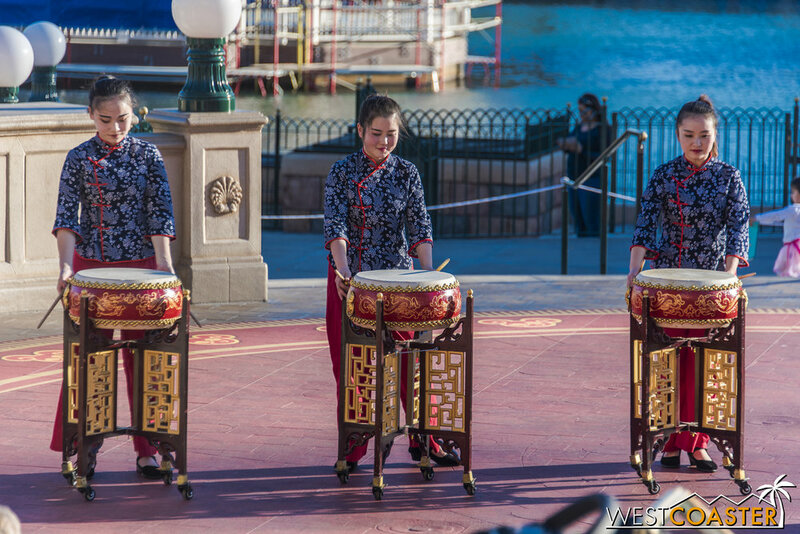 A scaled down version of the Food and Wine Festival is back with this year's Lunar New Year celebration. Tastes from Korean, China, and Vietnam can be found at three booths located from The Little Mermaid to the Golden Zephyr. In addition, the Paradise Garden Grill returns its Asian themed menu with the same offerings as last year, plus a Vietnamese bánh mì sandwich. Pork baos and almond cookies also return at a small stand in the Boardwalk restaurant seating area. I didn't try everything available--for a full review of this year's Lunar New Year food booths, check out the excellent review from our friends at Disney Food Blog. Most of the dishes I had tried last year, while others I skipped because, being Asian, I couldn't quite stomach paying 3-4 times the cost for something that I can get outside of the park from authentic establishment (I know Disney always has an upcharge, but most of the time, it feels more like twice the cost at most). Here's the menu for the Korea booth. The absolutely delicious Kimchi Bokkeumbap and Yachae Mandu return, though the dessert option and plum wine cocktail are different this year. China returns almost the same menu as last year also, but The Sânbêijî is new. Vietnam returns exactly the same menu as last year. I'd like to try the Bánh Chu'ng the next time I visit. The Chao Tôm was very tasty in its dipping sauce last year, but a bit pricey for the amount of food offered--even by Disney standards! The Paradise Garden Grill has the same seasonal menu as last year too, plus a bánh mì. From last year's tastings, I wouldn't necessarily recommend the Japchae or Pho, to be honest. The Galbi was delicious, though! The Pork Bao and Almond Cookies are back too. You can find them at this stand. I got the friend rice and Korean dumplings again on my visit this past weekend. They were as delicious as I remembered from last year. The dumplings and their dipping sauce were particularly tasty. I even put the sauce in the fried rice too. The Three Cup Chicken was new this year, so I tried that. It was very flavorful, but if I had to be critical, I would say that it was a little too salty. Still tasty, though! The Passionfruit Green Iced Tea was very refreshing and quite sweet, and the lychee pearls provided a delectable pop of lychee fruit flavor. I'd recommend it. I still haven't had a chance to try the fish at the Garden Grill, but the Galbi remains quite excellent. Similar to the Food and Wine Festival and the Festival of Holidays set-up, there is a merchandise table off of the west side of The Little Mermaid show building featuring lunar new year goodies like T-shirts and pins. Balloons are also available throughout the park, with a cute design lent from Shanghai Disneyland. For Disney fans who enjoy collecting seasonal event souvenirs, this is for them. Lunar New Year balloons from Shanghai Disneyland are being sold throughout DCA right now. They're pretty darn cute! A merch stand over by The Little Mermaid offers a variety of Lunar New Year goods. It seemed to have a significant line all day. The pins, for example, ran out a couple of hours after I took this photo. I imagine they'll be restocked, though. You can also get Mickey and Minnie red envelopes. Annual Passholders can also swing by the AP corner located just left of the Garden Grill and get their free Year of the Dog pin, featuring Pluto! 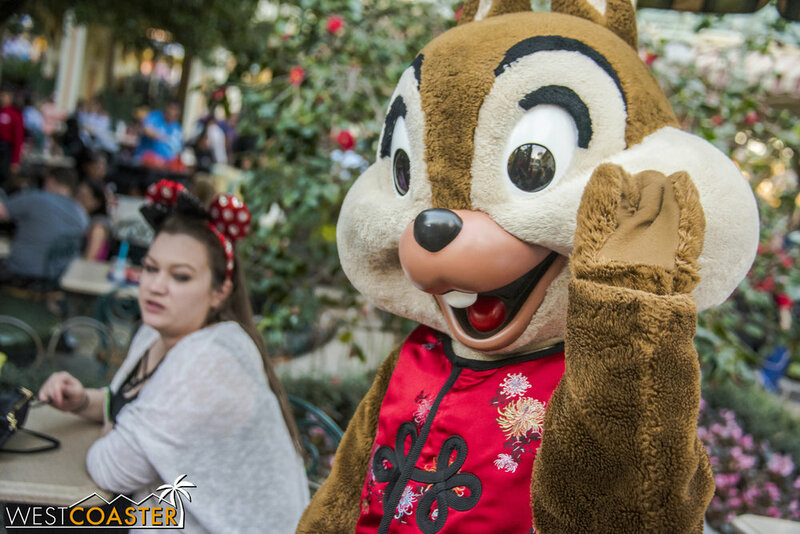 Of course, Disney wouldn't be complete without the opportunity to meet one's favorite characters, and Mickey and friends can be found in festive, traditional Chinese garb during the Lunar New Year celebration. 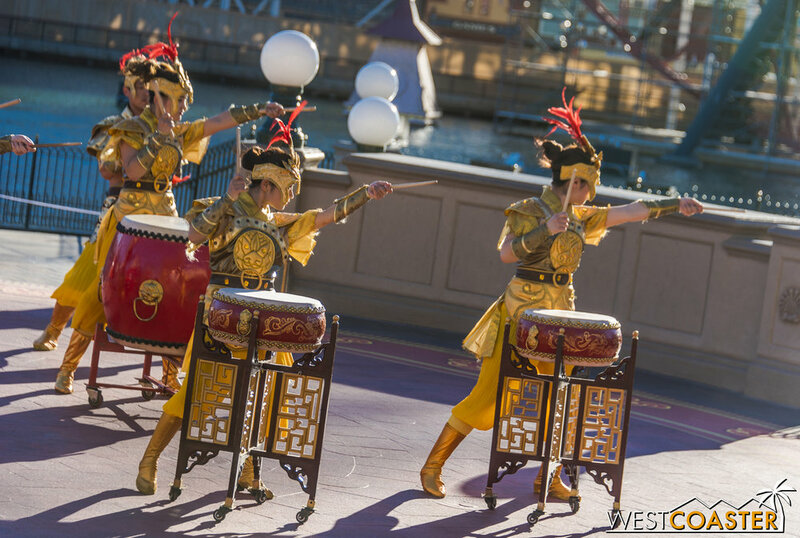 Guests can also meet with Mulan and Mushu, who of course serve as the most iconic Disney ambassadors to the festival. Mickey looks pretty dapper in his traditional Chinese garb. He's one of several characters guests can meet. Pluto was very excited this is his year. Did I mention that already? Just like last year, I ran into Chip & Dale. They were separate this time, though, and Dale was the one who really hammed it up for the camera. He showed off some of his martial arts moves. Don't mess with this chipmunk! Mulan was, naturally, the most popular meet-and-greet character of the day. Her interactions with guests were quite magical. 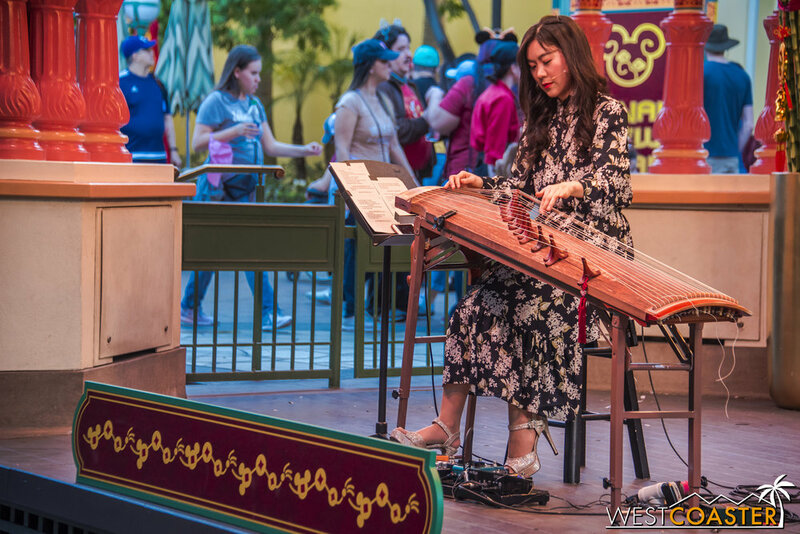 I might be biased, but it's always great to see Mulan out and about in the parks. 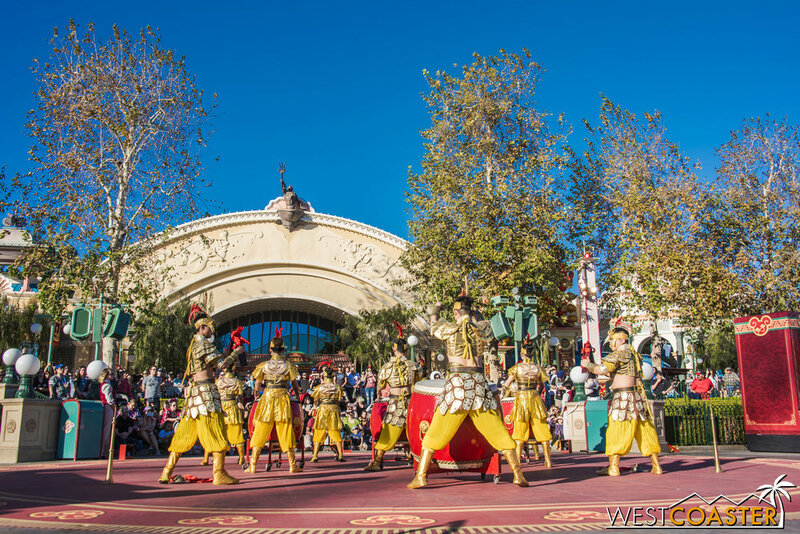 There are shows at Paradise Park (the existing World of Color viewing area) and the Paradise Garden Bandstand again this year, plus the return of the Mulan New Year Processional (not a parade, a processional. These run several times a day and are good for a couple of hours of entertainment for guests outside of the food, shopping, and activities available. 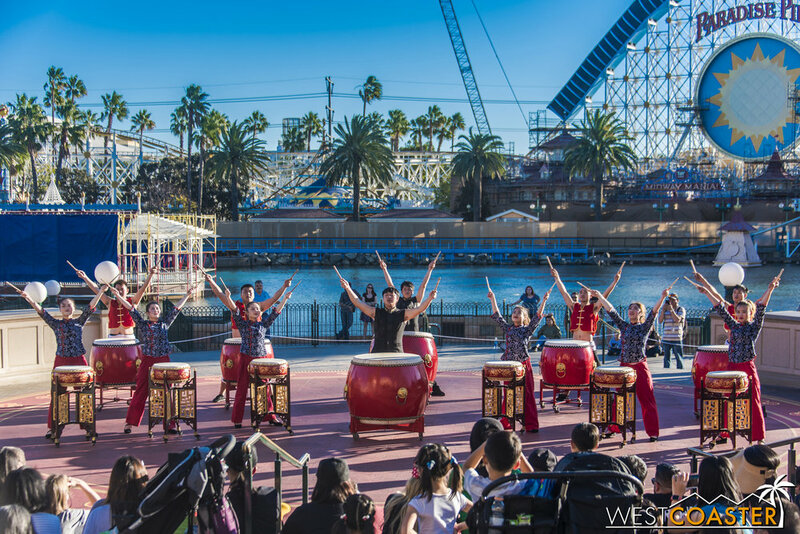 The GuGu Drum Group comes from Shanghai, China, and offers theatrical storytelling in the form of traditional Chinese drumming. Their 20 minute show is full of pounding percussion and stirring beats, and they replace the Chinese Acrobats who performed here last year. The GuGu Drum Group show consists of four acts, each telling a different story. This one features two tigers playfully pawing and fighting with each other. 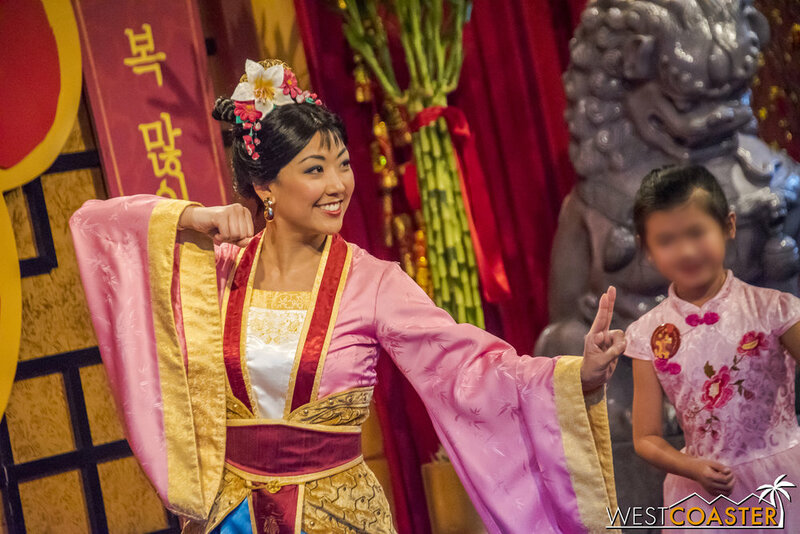 It's a great show and definitely recommended for all guests of the Lunar New Year celebration. 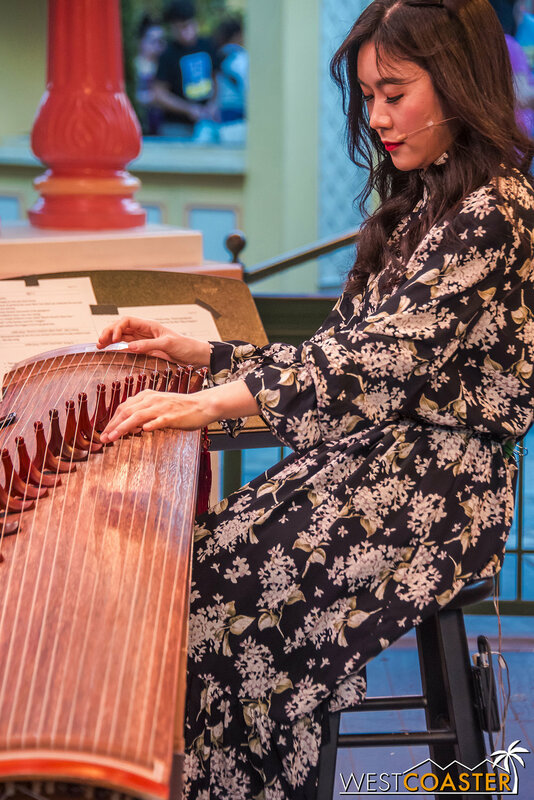 Luna Lee is a gayageum musician from South Korea who puts a modern twist on an age-old traditional Korean stringed instrument. She gained fame on YouTube with covers of classic rock songs from artists like Jimi Hendrix, Pink Floyd, and The Beatles, not to mention other famed rockers like AC/DC, Red Hot Chili Peppers, and more. 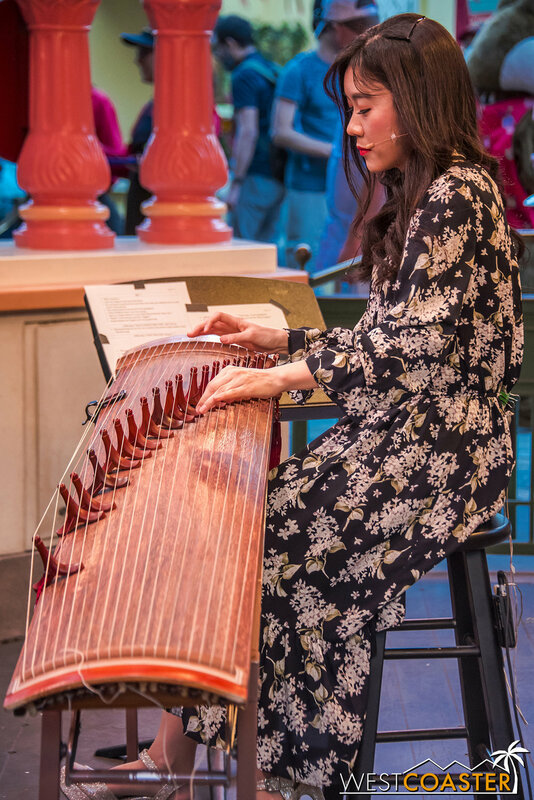 Her performances of contemporary music on a traditional instrument has brought out greater exposure of the gayageum, and she brings her talents to the Paradise Gardens Bandstand Saturdays, Sundays, Tuesdays, Wednesdays, and Thursdays. Luna Lee has several 15 minute sets in the Paradise Garden Bandstand. Funny enough, I hadn't heard of her until a week ago, when a friend posted a video of her gayageum cover of AC/DC's "Back in Black" on Facebook. When I learned she would be almost coincidentally performing at DCA, I had to see her live, and she provided a fun show! 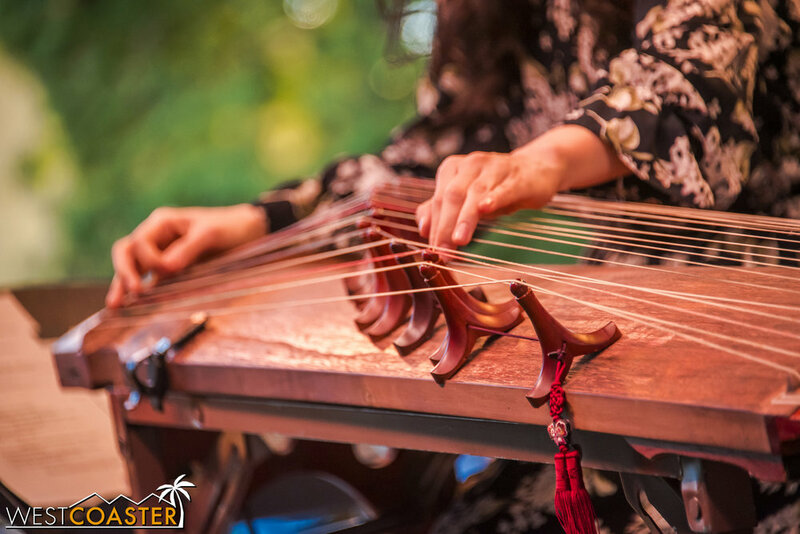 On Mondays and Fridays, blind Vietnamese musician Dat Nguyen also performs at the Paradise Gardens Bandstand. I didn't get any photos of him for this update, but we did talk about him a little bit in last year's update. Finally, several times a day along part of the Paradise Pier section of the DCA parade corridor, Mulan's New Year Procession takes place with a flourish of traditional Chinese drummers, dragon performers, and traditional dancers--not to mention Mulan and Mushu as well. Goofy joins in the celebration as well, imparting his lovable and infectious energy and excitement for this spirited holiday. Viewing for this little show is in high demand, and guests should consider arriving half an hour early for prime viewing spots. The main performance occurs just outside the entrance of the Boardwalk restaurants dining area and Goofy's Sky School (which may lend the connection to why Goofy is involved). 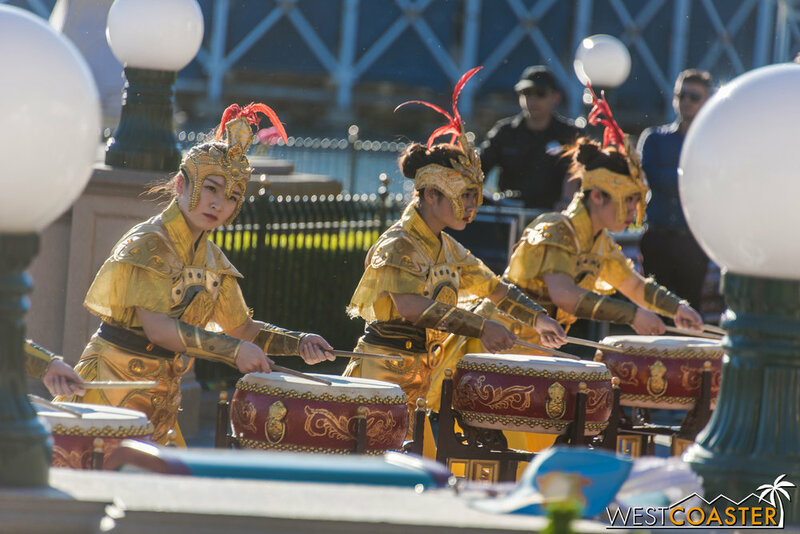 Mulan's New Year Procession is a dash of zip and energy. 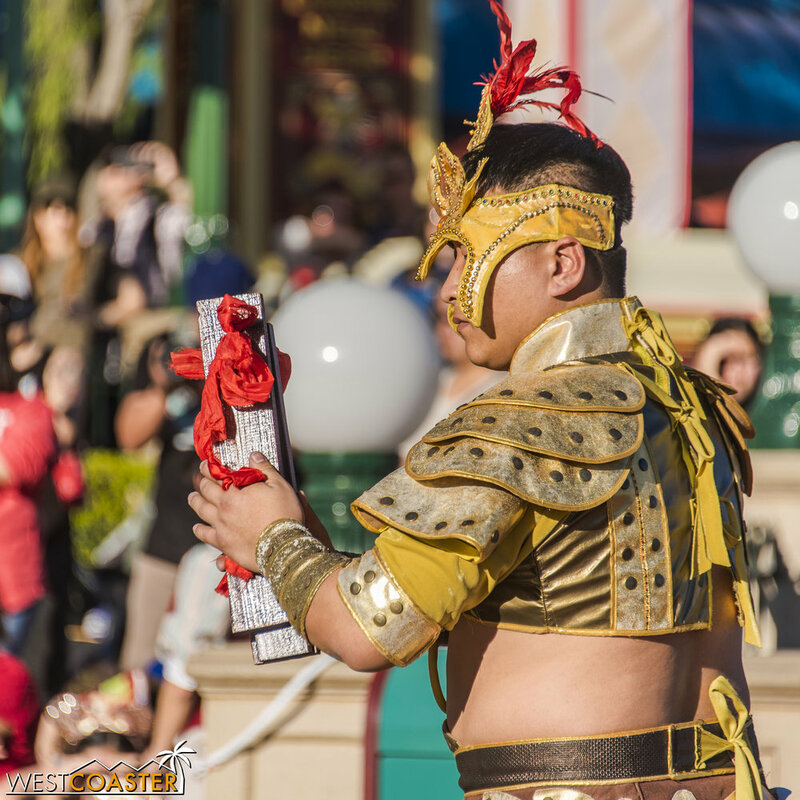 There is a lot going on during this mini-parade celebration of Chinese New Year. It's a great show and quite popular too! 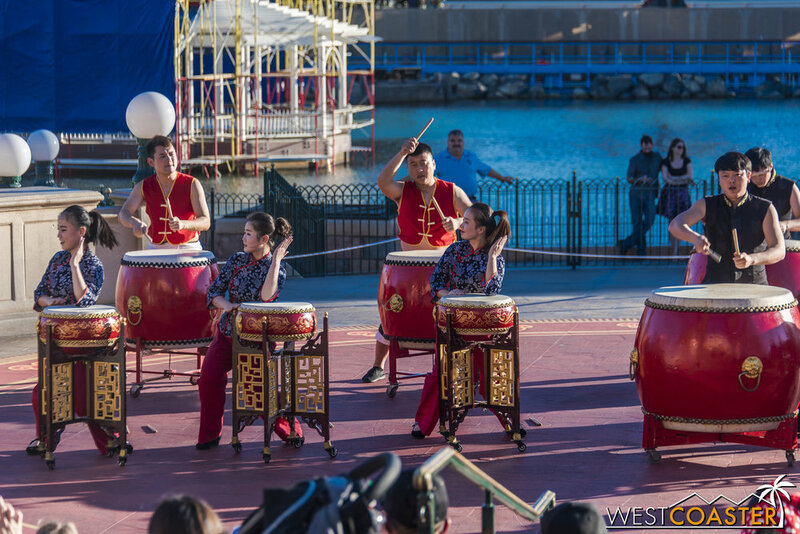 Once again this year, World of Color features a little pre-show called Hurry Home - Lunar New Year Celebration. I wasn't able to get photos of this last weekend when I visited due to schedule conflicts, but it's a delightful little show with the regular Word of Color fountains and projections, plus a pop of pyrotechnics, telling the story of trying to return home in time to celebrate the new year. Check back later for photos of the segment when (if) I'm able to get some. 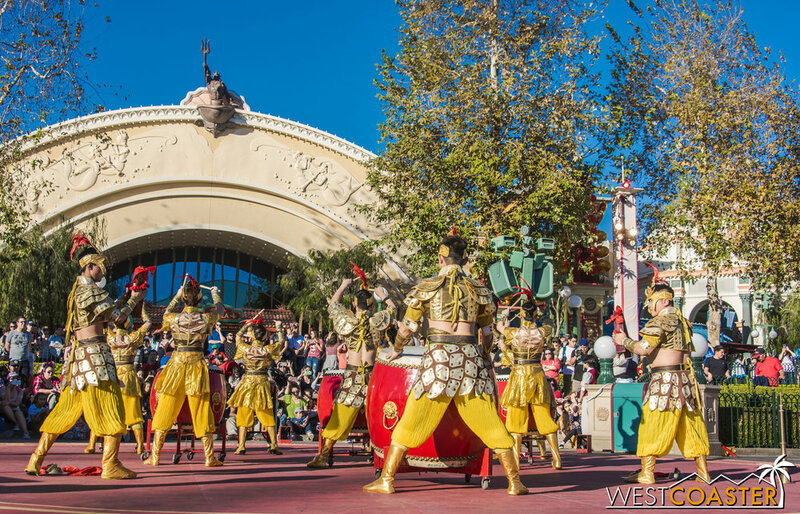 That is it for the Lunar New Year Festival and from the Disneyland Resort for this week! We've spent four updates (well, maybe two but one was split into three parts) catching up on a lot of missed content during the month and a half we were gone, so hopefully, you consider yourself up to date now! Happy year of the dog! The actual Lunar New Year falls on Friday, February 16 this year. We still have one more theme park update planned this week--another trip to Knott's Berry Farm to recap their new Peanuts Celebration this year. It's a really cute and very fun ode to all things Snoopy and Charlie Brown and Linus and Lucy and Sally and the whole gang. So stay tuned for that!